It would be nice to have that kind of speed in your internet connection right? 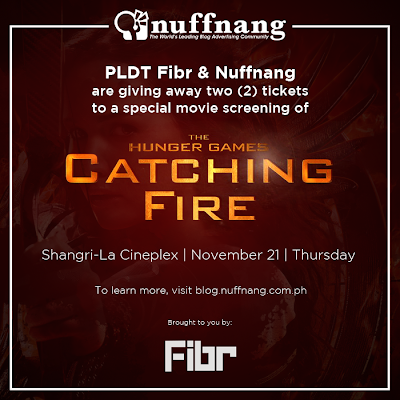 And since the latest installment of the Hunger Games movie franchise is coming out, PLDT and Nuffnang is asking "how you would use Fibr to help you win in Hunger Games?" Hmmm. Maybe I would use the fast internet connection to research about my opponents and check out their techniques and find their weaknesses. That way, I would know how to depend myself against them as well as how I can use their weak points to my advantage. I would also use the internet connection to search for YouTube videos for self-help or DIY instructions on different fighting and survival techniques. And since I would also need a beautiful dress for the introduction of the tributes, I would also use Fibr to search for a unique design of dress. Pronto! After all the preparations, of course, the tension is going to be palpable especially since I wouldn't be sure if I'll survive. It's now time to relax and take advantage of the free movies on-demand on ClickPlay. - Visit www.pldthome.com or call 101-FIBR (3427) for more details. 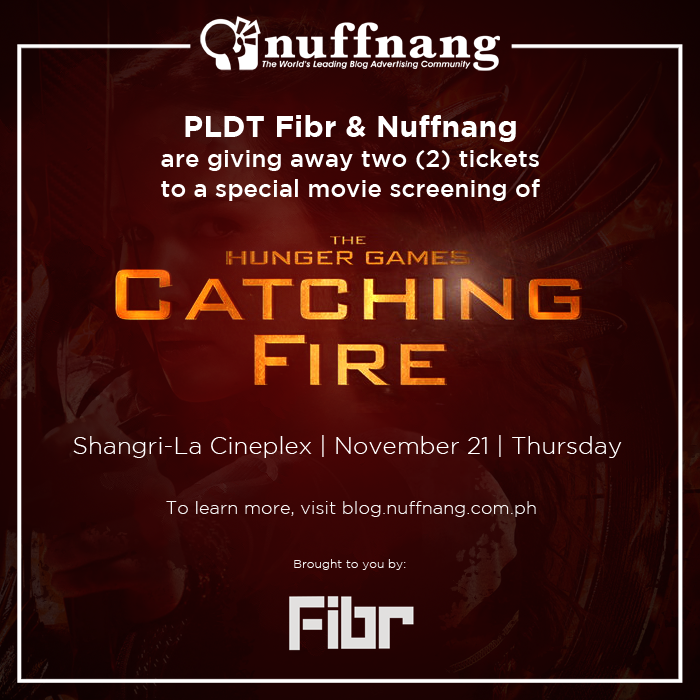 Nuffnang and PLDT Fibr have partnered to give away advanced screening tickets to one the most awaited movies of the year; The Hunger Games: Catching Fire. Check out the pic below for details!